Home / Baby / Breastfeeding / Relax Mama. It's OK if Breastfeeding Doesn't Work Out. Relax Mama. It's OK if Breastfeeding Doesn't Work Out. In this time of mommy wars and formula shaming, there's a lot of pressure on moms to breastfeed. The immense amount of pressure some women put on themselves to make breastfeeding work out can be a detriment to establishing a happy breastfeeding relationship. We're constantly reminded that "breast is best" and while breastfeeding moms do need support, education and encouragement it can leave a lot of guilt on the shoulders of moms who can't or aren't breastfeeding. Well I'm here to say, relax. All that truly matters is that your baby is healthy and getting fed. There are any number of reasons a woman may not breastfeed. Up to 5% of women cannot produce enough breast milk and some may not be able to produce any at all. Women may need to be on medication that is not breastfeeding compatible. Some pumping mamas may have trouble keeping up with their baby's needs. 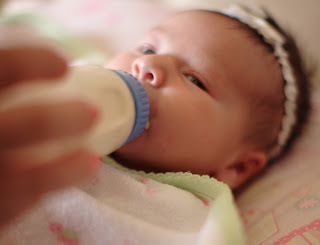 Some babies have allergies that make breastfeeding nearly impossible. Some moms may experience depression or anxiety while breastfeeding. Some women may simply decide breastfeeding is not for them. And that's ok. You don't need to explain yourself to anyone. Infant formula has come a long way over the years. It is a perfectly healthy way to feed your baby. Formula has all the proteins, sugars, fats and vitamins necessary to grow a happy, healthy, smart baby. A fed baby is always better than a hungry baby. So many moms feel guilty when giving their baby formula; some even feel like they've failed as a mother. I have seen mothers in tears because they had to make the switch. Do not feel guilty. Formula feeding is not a failure. The single most important thing is that your baby is getting fed and you're doing what is best for yourself and your family.